This is the tried and tested recipe for getting rid of ants. There are countless reports of its effectiveness and success from people who are overjoyed at finally being ant free. If this is your first attempt at treating a sugar ant infestation, be sure to try this recipe first. 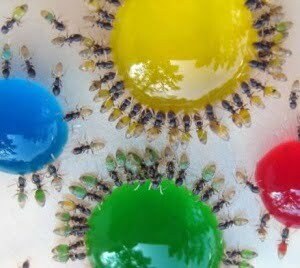 If you’re unsure if you have sugar ants or not, check out our article which helps you determine whether you have sugar or protein ants. A glass jar to store the left over bait mixture. Caution: Keep the baits away from children and pets. 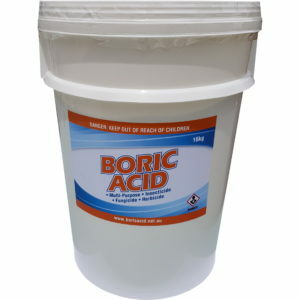 While Boric Acid is a least toxic treatment, you don’t want your children or pets coming into contact with it. On the day of laying the baits you have a couple of visitors and maybe a few more. These are the scouts who will consume your delicious fair and hurry back to the nest to tell the others. By day 2, the bait dishes should receive great patronage from the ants. They’ll happily help themselves and take it back to the nest for others, especially the queen, to consume. By day 3 you should notice a signification decrease in the ants. By day 4 most of, if not all, the ants will be gone and you’ll be ant free! 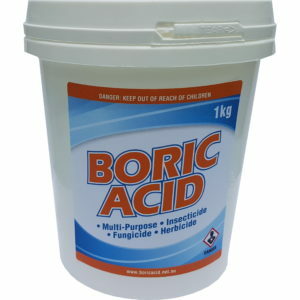 Mix the sugar and boric acid together in a mixing bowl which is large enough to hold the water. Gradually add the warm water, all the time stirring the sugar and boric acid so that it doesn’t get too lumpy. Once all the water is added and the sugar and boric acid is dissolved, you’re ready to bait-up! Find a location where the ants are found and arrange the jar lids. Pour the bait solution into the lid. To speed up the ants finding the bait, place a couple of drips of the solution over the edge of the lid and on the surrounding surface. The bait should last for a couple of days. If it becomes empty, you can refill it. Once the ants find the bait, leave them be and let them do their work. You can be tempted to spray them, but you want them to take the bait back to the nest. Don’t kill the messengers! Any excess you have can be stored in the air tight jar and keep it in a cool dark place, like a laundry cupboard. It will keep for a long time. Be sure to label the jar. What’s your tried and true method for getting rid of ants? There are so many ways to get rid of ants with boric acid and we’d love to hear about your experiences in the comments section below. Its summer here in Australia and i find the bait drying right out and crystallizing in an hour or so? Does it need to remain as a liquid form to work? They were all over it in liquid form but now dont touch it when its dried. Yes, the solution needs to be a liquid for it to work. If the bait does dry up, you can add some more. You mght also want to use a larger lid/saucer if it’s drying up so quick. Maybe also add more water to dilute the sugar/boric acid. Great guide! I have a couple of questions, though. 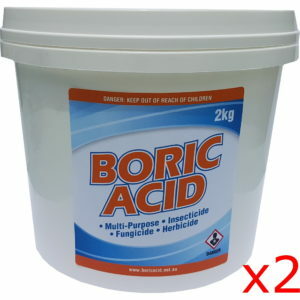 How exactly do you measure out 25g of boric acid? How gradually do you add each cup of water? For example, do you wait until the the acid and sugar has dissolved before adding a new cup? A photo of the end result would be great, because we’d have something to compare our own solutions to. To measure 25g, you can use ordinary kitchen scales. You don’t really have to be that delicate when adding the water. But sometimes the mixture does clump up if you add all the water at once. But more water and stirring will get rid of the clumps. I have a meat ant problem. I have a meat ant problem. How should I apply Boric Acid to get rid of them and move/get rid of their large nests near the house. 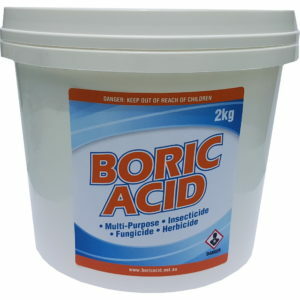 Boric acid is great for treating ant problems in the house. But outside is a different story. Ants do form a vital part of our ecosystem and the outdoors is sort of their domain. The main challenge is that you don’t have as much control over the environment. It’s very difficult to ensure that only the ants can get to your bait and not other insects or animals. To do this, each location must be individually assessed and a specific strategy determined. I have a major problem with tiny ants pulling all the sand from under our pavers. I sweep the sand back and flood them with boiling water in an attempt to kill them. However, they do return after a couple of days and so the cycle continues. Our how to guides are geared towards indoor use. Treating insect problems outdoors is vastly more complex. The main reason is because you have virtually no control over the environment. The ants nest could be extremely deep and wide and you don’t have walls and floors to contrain them. You also don’t have doors to stop animals and people entering treated areas. You may need to consult with a professional. I’m puzzled over how to protect non-target species and I ended up getting take away containers, cutting slits in the sides, putting the mixture inside, putting the lid on and putting a brick on top. I have used this mixture outside but used Borax instead – unsure of results, still early days. 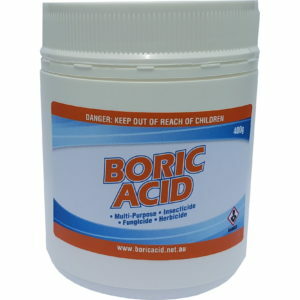 I came to this site looking for Boric Acid as it seems to be more effective. I have also used a few drops of petrol down the ant hole – it reeks out their nest and they move on – merely moving the problem elsewhere but it does move them away from the current nest. That’s the main challenge with tackling insect problems in nature. How do you ensure your treatment only affects the target species. It’s extremely difficult to do without some “collateral damage”. But techniques specific to each environment, like the ones you mentioned, are vital for the best outcome. And yes, petrol is not a good option. You want to eradicate problematic insects, not move them. 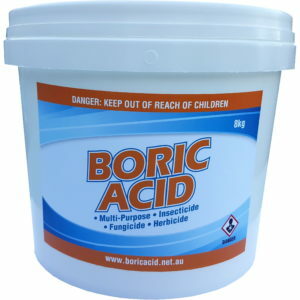 Will a small amount of boric acid be sufficient to do the job? I’m making a small amount of maple syrup and what I consider a fair amount of boric acid to the mix. I have to drop small puddles of it in the floor to get them into it and they do swarm it but I’m afraid if I use too much acid they won’t go for it. Does it need to be a paste? A small amount in the maple syrup should be fine. You may need to play around with the amount. Too little and it may not work. Too much and as you said they may not go for it. They can be fussy at times. Thank you Louise. Just to let you know I’m in Phnom Penh Cambodia and the ants here are either black or red small ones.They pass up my white sugar and go for the brown sugar and maple favored syrup (white sugar, water & maple flavoring) on the shelf next to each other. It may be a alternative to your recipe. I did see a Utube vid where a man in the US used roach powder containing boric acid and maple flavored syrup to get rid of an outside fire ant problem over night. My red ants were the 1st to go and after I assume the colony was eliminated the black ones took over and now their numbers have dwindled so I assume (hope) that they too will be gone soon.